Better And Better: Micro climate. I've always been impressed with how, even though the Official Weather Station for our area may report temperatures of, say, 39 degrees, I could have frost on my lawn. 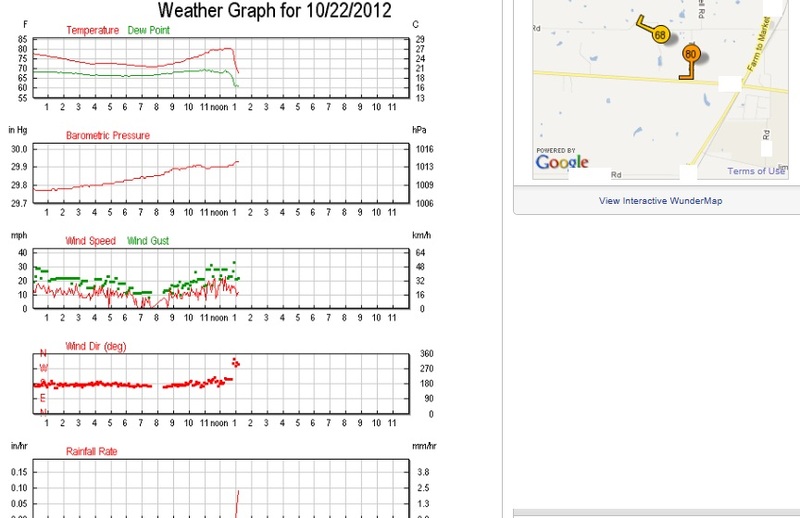 Or how when the weather station shows dry and still just a mile away, it's raining and gusting at my house. Climate is what you expect. Weather is what you get. Micro climates personalize what you get on a regular basis. Maybe your house is near a creek, in the shadow of a hill and in the lee of the wind? You'll find that your house is dank in the cool months and muggy in the warm months, despite your local predictions of dry and fresh. Maybe you live next to a major heat sink, like a large concrete parking lot and between large low brick and concrete structures? In such a case, your first impression out the front door will always be that a sweater or jacket is less necessary than the rest of the people in your zip code. Check out what's going on there. 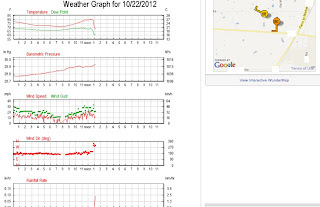 The two weather stations on the map on the right show vastly different temperatures despite their proximity. But also you'll note that the higher temperature station still shows a wind from the south, while the western one now shows a brisk wind from the northwest. On the bottom graph, you can see that the change in the wind brought some rain that ramped up quickly, and the top graph shows that the temperature and the dew point dropped rapidly in concert with the changing wind direction (fourth graph). All in minutes. I have GOT to get a decent digital-compatible reporting weather station. For I am a weather geek. Yep, microclimates are an interesting phenomena. And they CAN occur within a very short distance of each other. When you bring large(r) bodies of water into the equation, it gets even more interesting... And it's 'fun' to watch!!! Also, mountain ranges. One July day in the Sange De Christos, I saw a cold front fill a valley before pouring over a mountain ridge and causing a canyon to go from 94 degrees to 40 degrees in a few minutes. One of the fascinating things I've found while reading old ranch records (1870s-1890s) is how little has changed. Complaints about the ranch headquarters getting rain but not the north pasture, or one area having frost and not others. There's no wind to turn the windmills but they did not get enough rain either, so they were using horses to run the pumps to get water to the cattle. Nothing has changed, except that winters are currently not as severe (although that seems to be changing as well, back to a 1800s pattern). Yes. Please copy your mother if and when you get this. I, too, am a weather geek. Which means fall and winter are wonderful for us, with so many changes. So many possibilities. Summer? eh. Not so much. Except when the August rains come as they usually do. Ask people living North of Seattle about the "Puget Sound Convergence Zone". I love you. How wonderful that you are a weather geek. because I am one, too. Is this genetic or environmental or both? I have always been interested in weather but really became a "weather geek" while studying for my pilot license. Are you familiar with Weather Underground (www.wunderground.com)? If not, you DEFINITELY need to check it out.